This is my cross-it-scarf. 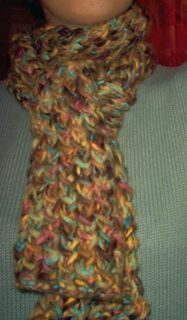 I liked the my-so-called-scarf on another blog, but found the pattern a bit confusing. Looking through my old stitch pattern book I found a similar pattern which was much easier but had the same effect! I used Lang Yarns "Sansibar", but it very much resembles the Lion brand "Landscape"-atleast on photos I've seen. I used three skeins and it's approximately 1,50 cm long. It will be a bit longer once I block it. Attention(so my book sais): The pattern leans toward one side and is therefore not recommended for larger pieces! Original pattern and photographs © 2005 Janin Den. You have the permission to reproduce, sell and distribute this pattern in any form! Hey, it’s so basic, anyway. I know this post is almost a year old, but I'm just now finding it. Thanks so much for posting this pattern. I also really like the look of My So Called Scarf, but the pattern looks way too confusing for me. I'll definitely try this one! Lovely scarf! the yarn is delicious! This is a Flickr badge showing photos in a set called knitlady. Make your own badge here.